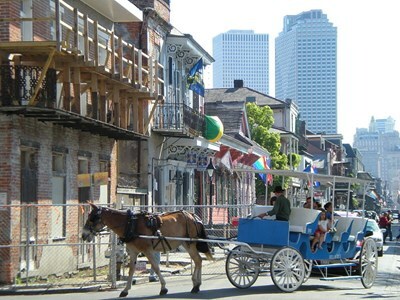 The French Quarter, also known as the Vieux Carré, is the oldest neighborhood in the city of New Orleans. When New Orleans (La Nouvelle-Orléans in French) was founded in 1718 by Jean-Baptiste Le Moyne de Bienville, the city was originally centered on the French Quarter, or the Vieux Carré ("Old Square" in French) as it was known then. While the area is still referred to as the Vieux Carré by some, it is more commonly known as the French Quarter today, or simply "The Quarter. This description uses material from the Wikipedia article on French Quarter and is licensed under the Creative Commons Attribution-ShareAlike License (view authors). 78 people want to do this.